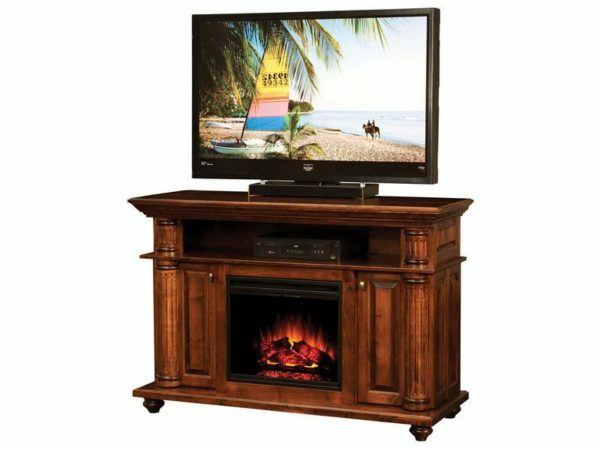 With its innovative DVD storage, great design and solid hardwood construction, the Bryant Fireplace Media Console represents a fireplace and entertainment center you’d be proud to have in your living room or den. We made the TV component opening wide enough for your DVD player and other devices. Plus, unique, swing-out media storage units open up on both sides of the fireplace. Also, we placed handy DVD storage shelves in the swing-out sections. Plus adjustable shelves in the console itself. So you’ll have lots of space for your DVDs and CDs. Behind the solid glass door, we included a Classic Flame Fireplace Insert. It has six full-functioning flame settings. Plus a heat on/off control. Also a timer and multi-color flame technology. What’s more, the 4,600 BTU system can heat a 400 sq. ft. area. Also, you get a full-functioning remote. In addition, we provide a 1-year warranty through the manufacturer. Plus, we threw in a four-outlet power harness to make hookups easier. 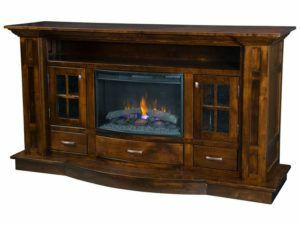 You can order the Bryant Fireplace Media Console without a fireplace. And you can insert a stereo with speakers in lieu of the fireplace. 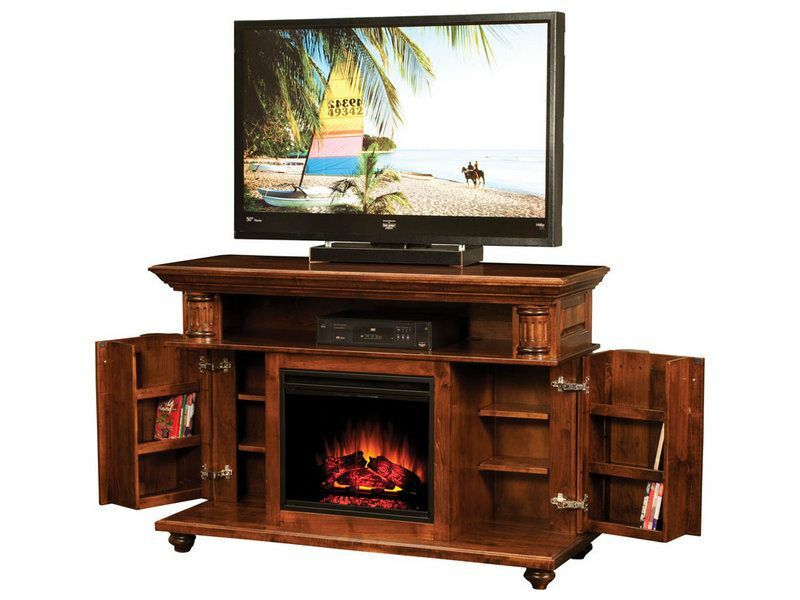 Skilled Amish cabinetmakers handcraft each Bryant Fireplace Media Console. And they use solid Midwestern hardwoods. Like oak, cherry, hickory or brown maple (shown with Ashbury Brown Stain). 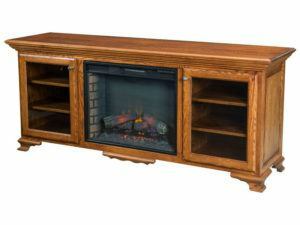 So the fireplace will add warmth, comfort and security to your family for generations to come. You can order the unit as shown or unfinished. And we can customize it to meet your desires. For a quote, click on the “Custom Options” link. 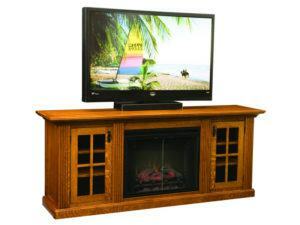 Then, select your preferences regarding wood specie/finish and flame insert. Plus the DVD/TV component opening. Also, complete the “Request Your Quote” field. Because this is the ideal place to tell us your other custom ideas. And if you’re relatively close to Shipshewana, Indiana, visit our store. 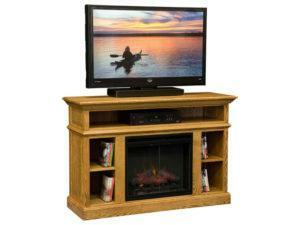 And explore our wide assortment of quality, Amish-built, solid hardwood furniture for yourself.